This is a black and white snapshot of Antoinette (Toni) Ciccarelli standing outdoors. 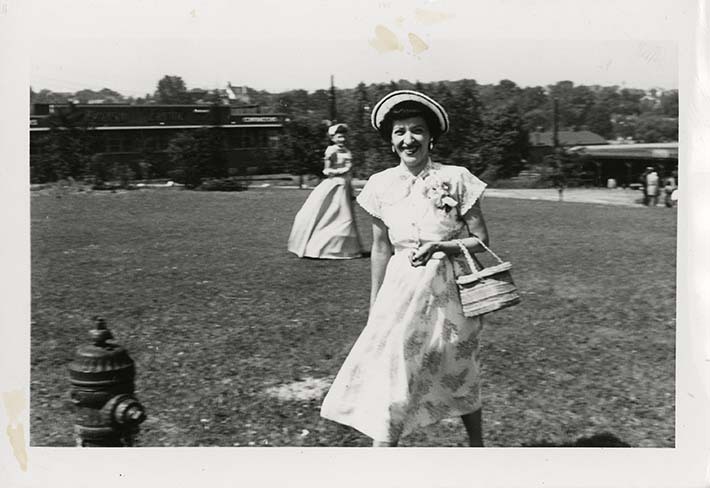 She is standing in a grounds area which includes buildings in the background and lots of trees. There are people in the far background, and a lady in the near background to Toni's right. The unknown lady appears to be dressed in white -- a full length dress with a full skirt, long gloves, and a bonnet. Toni is wearing a white flower printed dress that is short sleeved and has buttons and a collar. It is mid-calf in length. Her accessories include a white hat with a black stripe around the short brim, drop earrings, and a small rectangular shaped purse. She is smiling straight into the camera. To Toni's right is a fire hydrant.